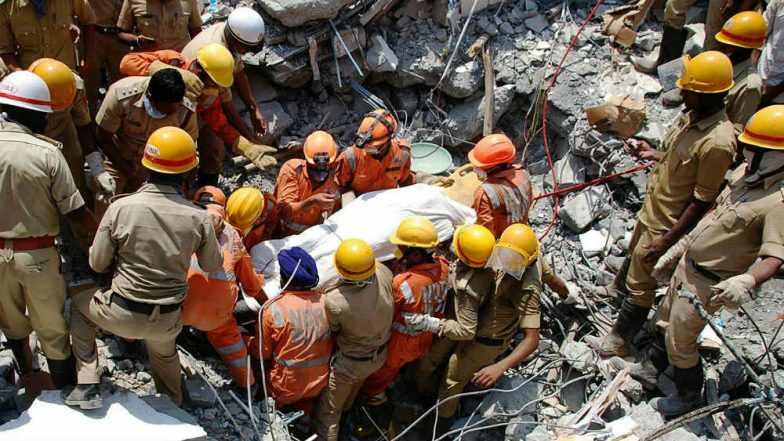 Bengaluru, March 22: The death toll in the building collapse in Karnataka's Dharwad rose to 14 with one more body retrieved from the debris on Friday, the fourth day of search and rescue operations. Some people are still believed to be trapped under debris. Blaming Congress leader Vinay Kulkarni for the collapse, the Bharatiya Janata Party (BJP) has demanded Chief Minister HD Kumaraswamy to send him behind bars. Several people were trapped under debris after a four-storey under-construction commercial complex building collapsed in Dharwad's Kumareshwar Nagar at around 3.50 pm on Tuesday. Initially, the death toll was two. However, during search and rescue operations, more bodies were recovered. The operation is being conducted jointly by the National Disaster Response Force (NDRF) and the State Disaster Response Force (SDRF). Kumaraswamy Visits Dharwad Building Collapse Site. HD Kumaraswamy has said that the rescue efforts will be conducted on a war footing and urged locals not to panic. The chief minister also visited the site on Thursday and said the government is ready to appoint a retired High Court judge if required. A magisterial inquiry, to be headed by a Deputy Commissioner, has been ordered into the accident. The police have also registered a case against the building owners. State unit Congress leader Vinay Kulkarni's kin was one of the owners of the building which was under construction. The cause of the collapse was not known. "It is a benami property owned by the Congress leader. The government should instruct the police to arrest the Congress leader after registering an FIR," BJP leader Madhusudhan was quoted as saying. More than 60 people have been rescued.